Numbers and data tables can be overwhelming to the user. Tickle their right brains with great looking graphs and charts. If you already know what you want, just let us know and we will create these pronto. 1) You already have graphs but want to improve story telling using better and more suitable graphics. 2) You have large volumes of data that needs to be converted into charts and graphs. Many a times, you may lack the time to add that extra bit and oomph that separates average slide from awesome presentations. 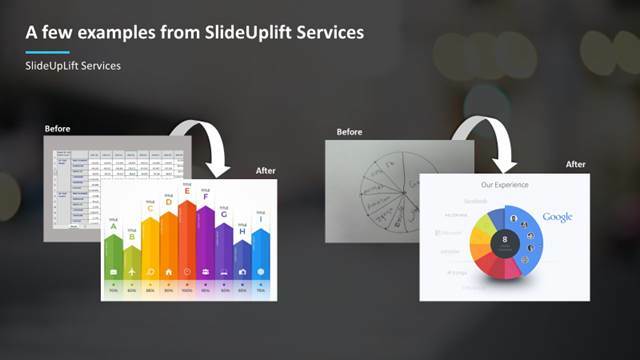 We will visually makeover your slides and ensure you get those extra brownie points and look great in your next deliverable. 1) You would like to improve the look and feel of your presentation using better and cool graphics. 2) You would like to upgrade old corporate presentations to your new color schemes or templates. 1) You have a sketch in your note book or white board that you would like convert into power point slides. If you have any of these needs, please contact us and we will be happy to work with you to help size the effort and provide you with the estimates. Those prefer to hire us on a project basis. Works well if a large amount of workload spike is expected over the short-medium term. The sizing of the team is done based on the anticipated volume. If you would like to try our services, please contact us and we will be happy to work with you.